San Francisco awaits you. Here is all the information you need to reserve lodging at an APA conference hotel and get to the conference center. APA has arranged discounts at four hotels in San Francisco. Discounted rates are limited and available on a first-come, first-served basis, so book your room early! Rates above do not include state and local taxes, currently 16.445 percent plus individual nightly fees or occupancy tax that varies for each hotel. All reservations require a credit card guarantee. When you call the reservation number, be sure to identify yourself as an APA conference attendee to ensure you receive our discounted rate and APA receives credit for your stay. Make any changes or cancel directly with your hotel. Hotel cancellation policies vary. The website for Moscone West (800 Howard St.) has directions and parking information. San Francisco is served by San Francisco International Airport (SFO), Oakland International Airport (OAK), and San Jose International Airport (SJC). Approximate distances from Moscone West are: SFO – 12 miles; OAK – 20 miles; and SJC – 45 miles. Information on mass transit options from the San Francisco International Airport can be found here. BART Rapid Rail, Caltrain, and SamTrans Public Bus Service operate from San Francisco Airport to downtown San Francisco. BART direct service from SFO and OAK is fast and easy with lower fares than ride share companies. Plus, it gets you from SFO or OAK to downtown San Francisco in 30 minutes or 45 minutes respectively. APA suggests taking BART airport service from SFO or OAK when you arrive and depart at either airport. 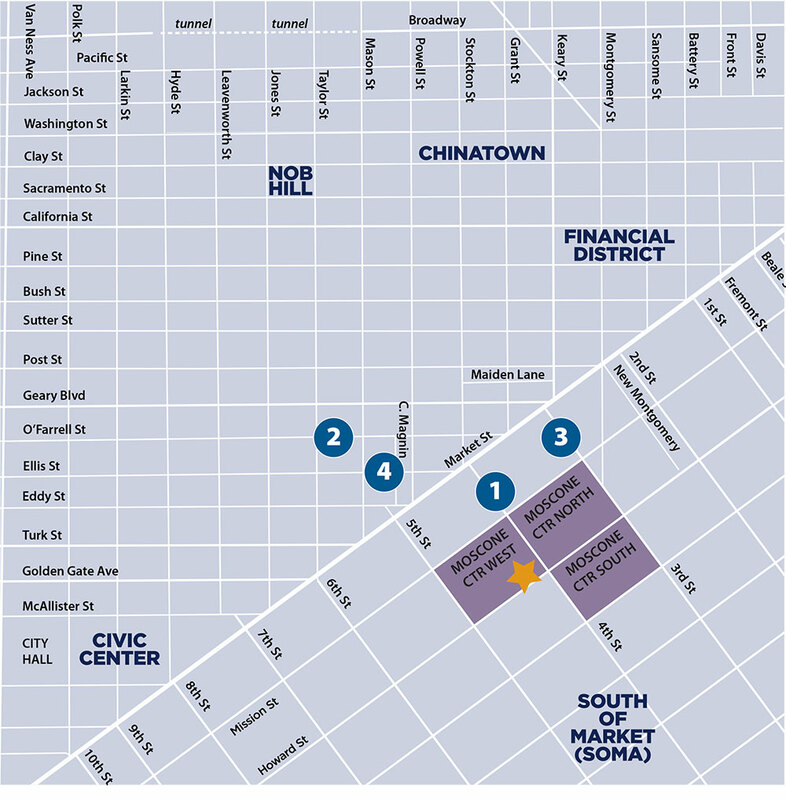 BART has four downtown San Francisco BART stations conveniently located within walking distance to most downtown hotels. We also encourage local attendees to take BART because of its easy access to Moscone. You can help APA achieve its sustainability goals by taking BART from SFO or OAK to your hotel in San Francisco. Taking BART prevents 20.2 lbs of carbon per round trip from entering the air. It's easy to get a round-trip (RT) BART SFO transfer to San Francisco when you fly into SFO. Buy a RT transfer voucher for only $21. Then print it, take it with you and exchange it at SFO for your BART ticket. This is the fast, easy, low cost way to get to downtown San Francisco. Getting to downtown San Francisco, Oakland or Berkeley from OAK is easy on BART. Just walk to the BART station across from Terminal 1 and board the train to the Coliseum station. When you arrive there, purchase a $21.90 RT ticket to San Francisco. The trip downtown takes 30-40 minutes. The ticket has enough value for your ride back to OAK. Monday through Friday: 4:00 a.m.–11:53 p.m. Nights and Weekends: Every 20 minutes. Some trains run past midnight. Check schedules for details. APA has partnered with American Airlines, United Airlines, and Hertz for group discounts. For the benefit of our conference attendees, a discount is available and valid a few days before and after the National Planning Conference, depending on carrier. To take advantage of these special discounted fares, call or make reservations directly through their respective websites listed below. Discounts do not apply to certain restricted fares and exclude sale fare inventories. *When using the American Airlines code, please walk through the entire reservation process and enter the discount code in the "promotional code" field at checkout.